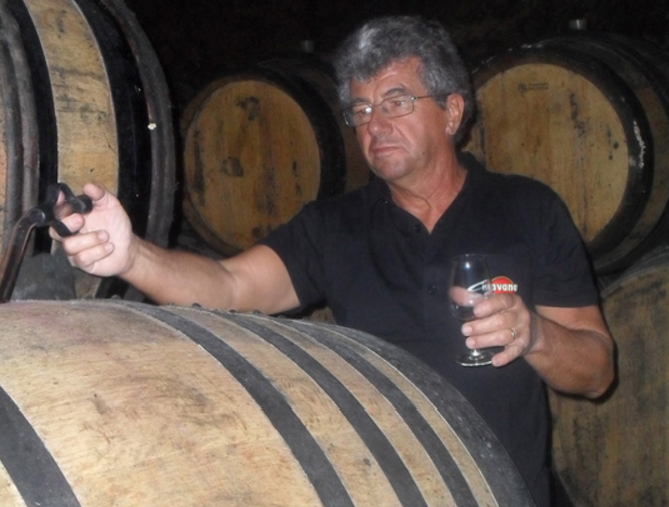 Bernard Ange began making wine in 1979 with his brother-in-law, and eventually established his own cellar with his wife Josiane in 1998 on the bank of the Herbasse River between Tain l’Hermitage and Romans. Grown on eight pebbly hectares of Rhône glacial alluvium, the vines are of Syrah, Marsanne, and Roussanne. The stony soils here help to store the sun’s heat to maintain temperature at night, while the Mistral wind of the Rhône valley helps to cool. Bernard prefers agriculture which is both respectful of the environment and encourages a good harvest, seeking above all an honest reflection of his land. In his ancient cellar, wines can rest at a naturally constant temperature in both winter and summer. Here, on this tiny pebbly estate, Bernard creates masterpieces which have reaped the benefits of his skill and patience in the vineyard and in the cellar. Grapes are handpicked from beginning September 15th from vines of 40 to 50 years planted in pebbly, alluvium soils. All grapes are de-stemmed, and vinification begins in a concrete tank under controlled temperatures for about three weeks. During this time, there are twice-daily pumpovers and three délestages. Malolactic is completed in the same concrete tank, after which the wine is moved to foudres and demi-muid to age for about twelve months.